Parading the suspects, the Police Commissioner, Anthony Ogbizi, said they were caught in the act at City Gobal Hotel, Aba, about 2a.m. He added that the suspects were nabbed following a distress call from the manager of the hotel. He noted that the manager alleged that the suspects were seen kissing one another at the hotel bar, by a worker, who reported the incident to the management. Ogbizi said the manager went to the hotel room where two of the suspects had checked in earlier and discovered that they were six in the room, romancing and kissing one another. 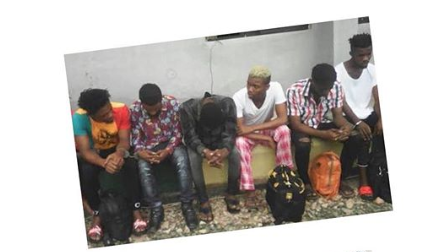 According to the police boss, the suspects were interrogated and it was discovered that they were members of a gang who came into the state from nearby states to practice unnatural act in the hotel room. The suspects were identified as Fred Ndubuisi, Anyanwu Chidera, Kamsiriochukwu Onuoha, Anderson Emeruwa , Sampson Nwadike and Nnadi Promise. However, they denied being homosexuals, adding said they were in Aba for the birthday party of their friend, Ndubuisi.